After Phedre is finished dealing with the Duc de Morhban, she sets out on her mission again. Being very pleased and intrigued with her company, he gives her several things. He gives her some clothing described simply as fine stuff that is fit for travel. 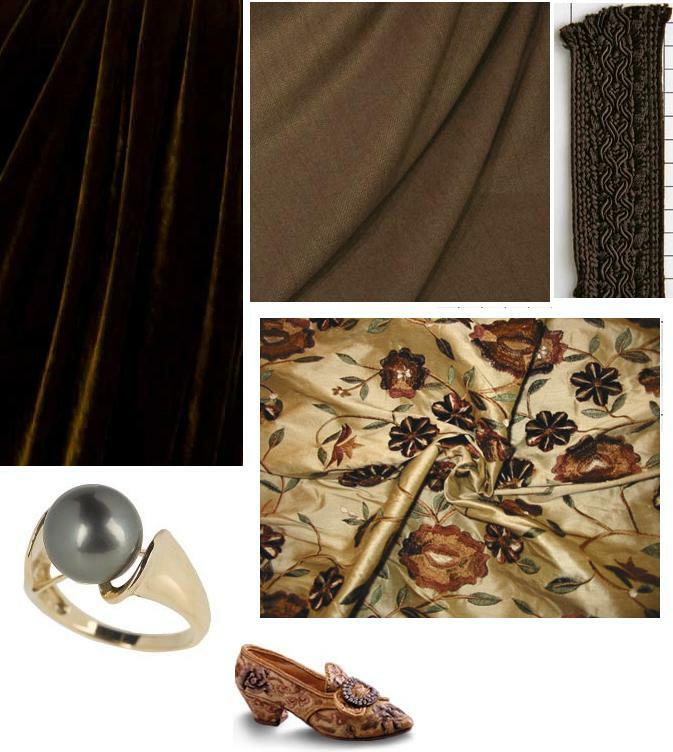 He giver her a deep brown velvet cloak. Finally, he gives her a black pearl circle ring. Though I don’t think the book necessarily gives the impression that they are all worn together, I have lumped them together for the purpose of this entry. I didn’t have a whole lot to go on for this dress. So it became a case of the fabric inspiring the design. I found a beautiful fabric (the sleeves) that I wanted to use and this was a great chance. I found it at the Online Silk Fabric Store. I will get on posting my favorite fabric store in the links section of the blog. Someday, when I get done designing and start actually making dresses, this is where I will shop. I live in a smallish city with a terrible fabric selection. So, the designs have a few fabrics. A velvet for the cloak, a wool for the dress. Silk for the sleeves and some binding ribbon for the sleeves and waistline. Not to be forgotten is the ring. I don’t claim to be a jewellery designer, so I found the one in the picture below. I discovered this Blog via Jacqueline Carey’s website. Congratulations – this is a real labour of love and beautifully put together. I particularly like the way you show us the fabrics and trimmings. I’m an author of historical fantasy, and I did a US tour with Jacqueline back in 2001. 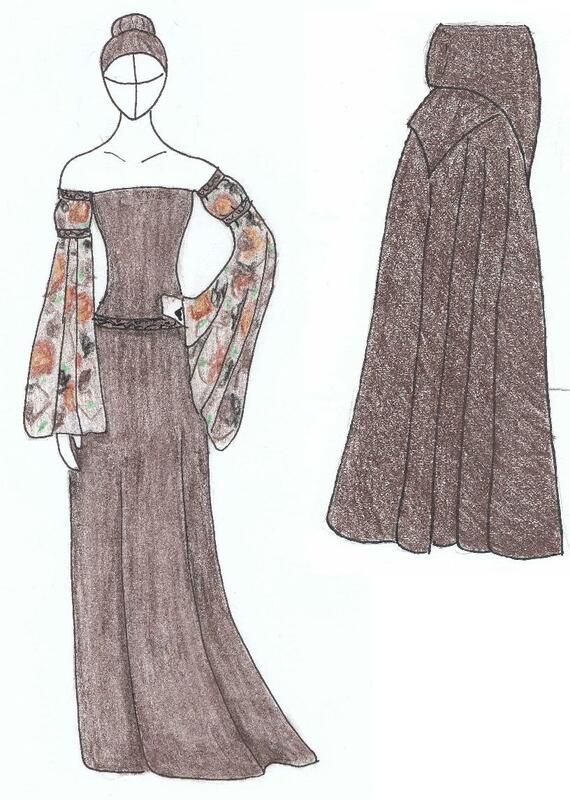 Wow, I just saw this from Jaqueline’s website as well and I must say I LOVE your interpretation of Phedre’s outfits. They look just as I imagined they would. Question though, more so out of curiosity and part on pure DESIRE to see it, what is the chances of you drawing up and making any of the male attire? Cause I would love to see things that different males had worn, I knew a few of them were mentioned (especially in Imriel’s trilogy)….. Anyways beautiful work! Would be fantastic to see a few of these on people! I am planning on working on some of the men’s costumes this weekend. A few people have asked about this, so I may take a break from Phedre and post some of Jocelin’s.